Pentax has admitted that its first compact system camera, the diminutive Pentax Q, is not selling as well as it had hoped for. Speaking at the launch of the Pentax K-01, the company's new 'designer' CSC, Jonathan Martin, General Manager for Pentax UK told TechRadar, "Though it [the Q] has been well received, we haven't seen the numbers that we would have liked to." 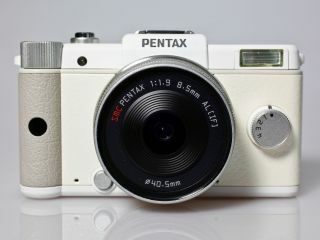 The Pentax Q was introduced in September last year and is the world's smallest interchangeable lens camera. It features a 12 million pixel 1/2.3 inch sensor which is far smaller in physical size than those of its rivals from Sony, Panasonic, Olympus and Samsung. It was followed by Nikon's compact system cameras, the Nikon 1 V1 and J1 which also feature small sensors. However the J1 is doing very well at the moment (according to Nikon), becoming the number one selling compact system camera at one point. At the time of the Q's release, reactions were mixed, while many existing Pentax users were apparently left disappointed by the lack of K-Mount compatibility, which the new K-01 offers. When asked why he thought the Q sales had been slow, Jonathan Martin told us, "The market was quite soft on CSC through Christmas, and we still need to do a job to convince people of the benefits of the Q." There had been rumours circulating that with the launch of the K-01 and a disappointing performance from the Q, that the smaller CSC would soon be retired, but Martin refuted that. "We are committed to the Q going forward and will continue to develop accessories for it. We also have promotions planned with key retailers and it's an area of the business that is still changing."